New "Texas Gold Star" Classic State Seal on the classic Genuine leather belt. 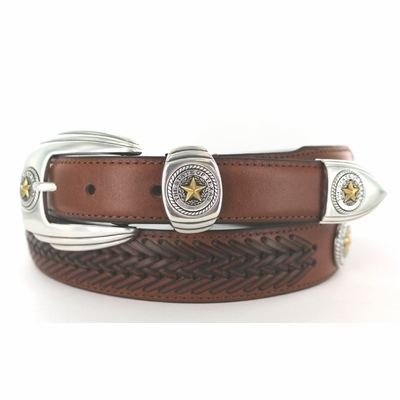 The Men's Dress/Casual Tan Southwestern Style Genuine Italian Leather Belt Strap with Brown Double 1/2 stitch pattern leather weave. 3 piece Antique Silver and Gold Buckle set with Classic Texas Star seal and 2 more added Antique Silver and Gold conchos with classic Texas seal. Belt Strap is 1 1/4 " wide and tapers to 1" at both ends. Sizes Available: 32" through 46" in length.